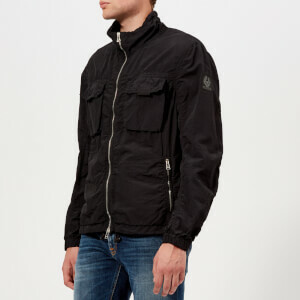 Lightweight jacket from British heritage brand, Belstaff. Crafted from crinkled fabric in a light pink tone, the ‘Pendeen’ shell jacket features a high funnel neck with an adjustable drawcord to the back, a two-way zip fastening and ribbed cuffs. The front of the jacket is detailed with Velcro patch pockets on the chest and side zip pockets. Complete with a drawcord adjustable hem and a signature Belstaff brand patch on the left sleeve. Model is 185cm/6'1" and wears a size IT 48/M. Most Belstaff garments come in Italian sizing. Please refer to the charts below to convert your usual size. You can find hints on measuring yourself accurately below. Chest - Measure around the fullest part of your chest, keeping tape firmly under your armpits and around your shoulder blades. Waist - Measure around your waist, slightly below your natural waist, where you normally wear your pants. Insert your forefinger between the tape and your body to allow ease in fit. Hip - Measure around the fullest part of your hips, inserting your forefinger between the tape and your hip to allow ease in fit. Neck - Measure around the base of your neck, inserting your forefinger between the tape and your neck to allow ease in fit.